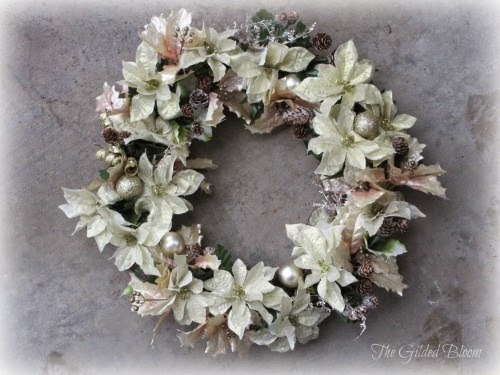 This winter wreath in golds and silvers was requested by a friend who wanted a shimmery, metallic look to hang through early January. Gold-dusted ivory poinsettias mixed with champagne tone holly and snowy pinecones capture the feeling of winter while providing sparkle for the holidays. 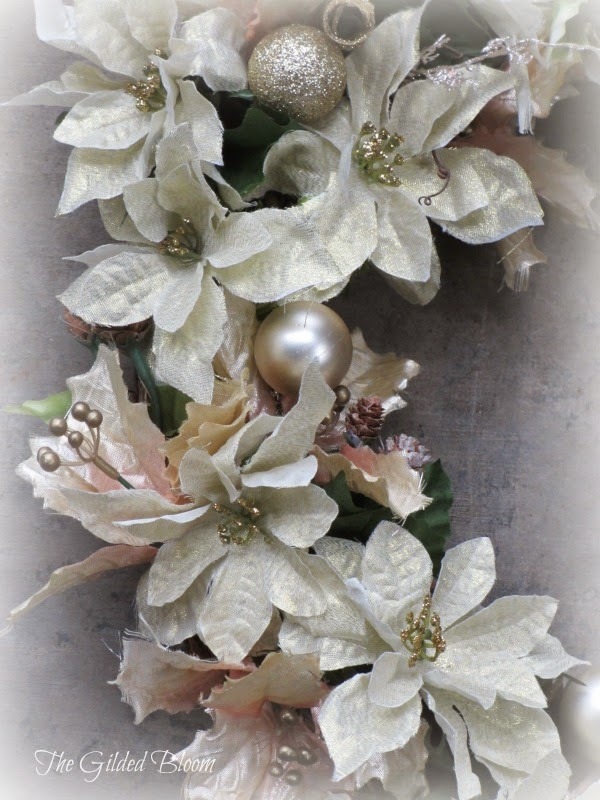 The soft gold poinsettias are shown with neutral silver glittery vines and champagne holly touched with rose for accent. 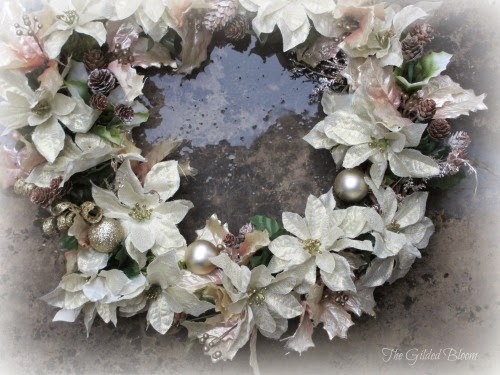 Ornaments in matte and glittery golds highlight the soft metallics throughout the wreath and add punctuation to the flowers. The Gilded Bloom now has a companion website called The Gilded Bloom Studio and is now on Facebook, Twitter, Pinterest and Instagram. For more floral inspired ideas and updates, please connect with me on these networks. You can also follow The Gilded Bloom on Bloglovin' or via email using the subscription box near the top of this page. Hope to see you there! 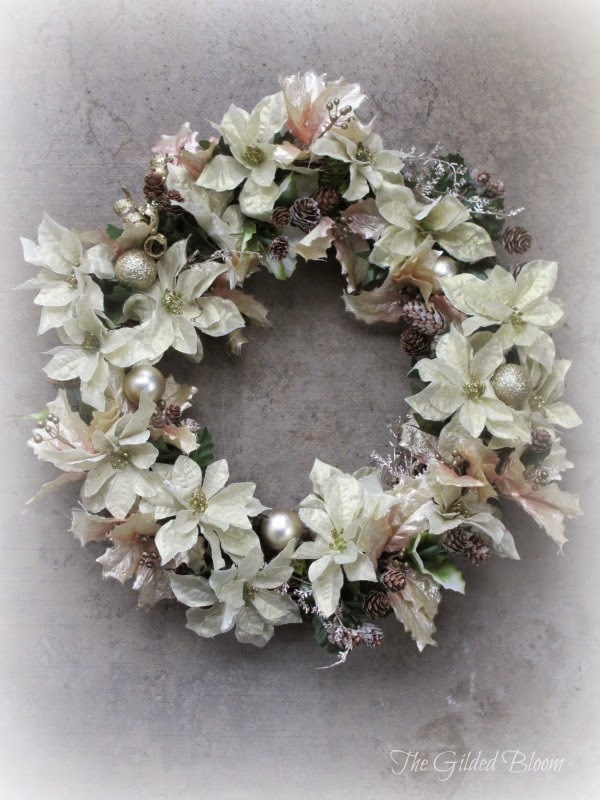 Hi Lisa, what a lucky friend to receive such a beautiful wreath! You've created such a lovely color combination and I love how you've incorporated the Christmas baubles. Happy Holidays! Thanks Sally. Happy holidays to you too! I would like to wish you a very Happy Christmas! Thank you, Ingrid! Merry Christmas to you too and a happy 2015!